Join us for a concert focused on the wealth of Iran national music, orchestral repertoire written for renowned Iranian singer Alireza Ghorbani with pieces composed by Homayoon Khorram, Farhad Fakhreddini, Fardin Khalatbari, Mahyar Alizadeh and many other influential Persian composers. This concert will feature Toronto Multicultural Orchestra, conducted by Maziar Heidari and North York Philharmonic Choir, conducted by Arash Fallahi. Virtuosity, ornamentation, invention and the ability to improvise are qualities common to several contemporary Iranian artists. But what remains remarkable about Ghorbani is the conjunction of all these perfections in a single singer. 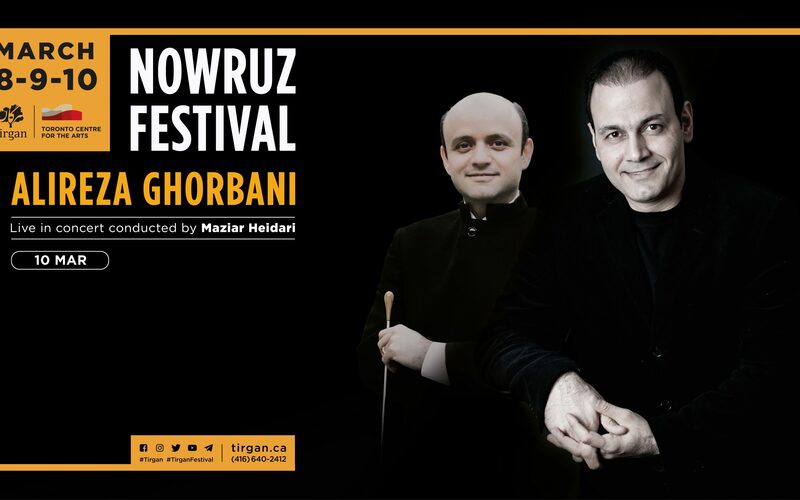 Alireza Ghorbani is part of the new generation of Persian classical singers. While deeply rooted in Persian classical music, Ghorbani has an insatiable curiosity and open-mindedness, which comes through in his vocal style. Born into a religious family, he acquired the intonations and rhythms of Koranic chanting at a young age. Ghorbani, born in 1972, began studying the Persian classical repertoire (radif) at the age of 12 with such masters as Mehdi Fallah, Hossein Omoumi and Ahmad Ebrahimi. His later work with Ali Tajvidi and Farhad Fakhre’ddini opened new horizons as he experimented with art songs (tasnif) from radio broadcasts of the 1960s and 1970s. In 1999, he joined Farhad Fakhre’ddini’s National Iranian Orchestra as lead vocalist, performing in Iran and abroad. His warm, resonant voice and songs that speak to the spirit of the times in Iran have made him particularly popular. He has made many recordings and collaborated with Majid Derakhshani, Sadeq Cheraghi, Pezhman Taheri, Houshang Kamkar, the National Iranian Orchestra, and the Shams Ensemble. His four years of study with a master of the tar (plucked lute) and setar (lute) at the Tehran Conservatory of Music acquainted him with the infinite possibilities found in Iran’s musical heritage. Ghorbani is widely considered a worthy successor to the undisputed masters of Persian classical music such as Maestro Mohammed Reza Shajarian.